Experienced Ret Paladin here who has done the first four willing to share my thoughts! Glyph of Double Jeopardy is pretty decent because of the constant switching between the boss and adds. Glyph of Burden of Guilt is very useful for slowing down the adds and should work with DJ since it requires the same ability. Fist of Justice will help slow adds down if they get too close to give you a few extra seconds. Glyph of Double Jeopardy is suggested since you'll be switching between three different bosses, and upon each of them hitting 33% and 66% more adds appear. Use Devotion Aura to relieve healers of some pressure during Dark Meditation. Glyph of Inquisition provides very, very few Inquisition rebuffs due to constant add fighting, and will cause it to rarely ever reset. Glyph of Double Jeopardy comes in great use because of the large amount of target switching, and increases your damage on them to get them down faster. Long Arm of the Law is good since Judgement will most likely be the first thing you cast when you target a new add, and helps you get to it quicker, and with DJ you get a little bit of extra damage upon use. Using Divine Protection (unglyphed) will allow you to move through Blind Hatred without taking much damage. Glyph of Inquisition is useful because of the AoEing on the adds, and you're likely to get at least one killing blow when doing so. Glyph of Double Jeopardy will prove handy for when you're switching between Pride and Manifestation. Glyph of Mass Exorcism does some good when the adds are swarming into your area, and increases your AoE damage, as well as increasing your likeliness to activate Glyph of Inquisition. Casting Devotion Aura and/or Divine Protection a few seconds before Swelling Pride is cast to reduce the damage caused to both you and the raid, depending on which one(s) you used. I tested these and did these during my runs, they aren't just guesses or ideas. I'll post more as I go through the bosses! Seems rather obvious, but switching to Seal of Justice for the adds will provide a small damage boost due to the 20% Holy Damage as opposed to Truth's 12(18 with Immediate Truth)and the fact that they last less than 3 globals. Also provides the benefit of slow if you get to melee it. Additionally, Devotion aura is strong when the adds are about to hit the center of the room. Try not to stack this with too many other CDs. As the fight increases, the frequency of these needed devotion auras increase. Save them particularly when a raid member looks relatively low (50% is probably the tipping point). For Immerseus selfless healer is a great talent choice to help out your healers with the blue slimes, especially toward the end where there are more of them than black slimes. Also, using blinding light on groups of black slimes will disorient them and buy extra time to single-target them down. I didn't try using it glyphed to see if that would work better/allow AoE but I plan to next week. For Thok, Devotion Aura is really handy to help your healers really push phase 1 by preventing the interrupt. If you have a druid healer, it might be good to team up with him/her to use Tranquility. Hand of Protection may also prevent healers from being interrupted, since the effect is from a physical damage attack, but this would need to be confirmed. I can confirm this. Our healers (in 25 man Thok) set up a specific rotation with me using aura mastery when called and hand of Protection (which they insit on calling BoP, but whatever) on a druid for Tranq or another healer when no druid is present. Iron Juggernaut: Take Clemency for the extra Hands of Protection to give you or another person more chances to pop mines unharmed. Speed of Light gets you back to the fight faster if you get hit by the knockback, or out to distant mines for HoP-popping. Thok the Bloodthirsty: Speed of Light is a pretty awesome way of getting away from him as soon as Blood Rage starts, and also works well for getting some distance while kiting. He's faster than walking, faster that Pursuit of Justice even with 3 Holy Power, once he gets up to around 12 stacks of the buff. Updated the opening post. Thanks! If you are 2-healing, glyph of hand of sacrifice to help healers with dispels. If 3-healing, don't bother. Most raid groups are stacking on one place to handle the adds, use Speed of Light talent to move quickly to the other side of the room in the 2nd phase or if you need to move to the edge quickly to avoid the water wave. If you can't avoid the water wave, bubble. Use your heals to save dps if no healer is around (especially in the 2nd phase). Unbreakable spirit - if you have cooldown reduction trinket, you will have a bubble ready for every Mark of Anguish. Also, if you get garrote soon in the fight, you can bubble to remove it and still have it ready for mark of anguish. Use hand of protection on healers if they are affected by garrote. You can use seal of justice in the orb phase because for low-health mobs it's faster then seal of truth. Use hand of sacrifice when someone has two stacks of mark of arrogance. Help out your healers by using divine protection when you have mark of arrogance, on swelling prides and when soaking fragments. Use speed of light to get to fragments and back. Use selfless healer free heal when needed, keep bubble on reserve for mark of arrogance or damage heavy phases. Paladins are not very great with aoe damage. Definitely use Light's Hammer and glyph of mass exorcism. Switch to Seal of Righteousness when a lot of adds are around. If you make a mistake and you get knocked off the tower, bubble fast (to survive the fall) and then use Speed of Light to get back fast. It's easy to survive but your raid will lose your dps for a moment. Keep using divine protection in the boss phase, bubble when you get a lot of stacks, devotion when healers can't keep up the healing. Keep your stuns on shamans. The most heavy damage is during the siege phase. You will get 3 shock pulses. Use divine protection on the first, bubble on the second and divine protection on the 3rd one. Don't use bubble on the first one or you won't be knocked off with your raid (which is what you want on HC). Use devotion aura on one of the 3 shock pulses. Don't bother taking clemency. Your tanks should be handling mines. The only exception is during the siege phase when you have just bubbled for the shock pulse. If a mine is close to you, you can take it. Use glyph of divine protection. You will need that 20% physical damage reduction for stone prisons. You won't have enough HoP and bubbles. Use devotion for one of the falling ashes. Use divine protection on falling ash when you are not affected by stone prison. Light's hammer can be useful to deal with the slime adds fast and survive in the melee range. If you have a DK tank, stand in his/her antimagic shield. Use hand of freedom when slowed by the adds. Don't forget your stuns to handle adds. You can save a range player from assassin by hand of protection. Also, blinding light is useful to stun/interrupt adds, don't forget this ability. Handle the pools in melee range. You can easily keep your green shield up by using selfless healer before/after soaking. You can use divine protection to reduce the damage. Use lay-on-hands on tank if you see him without shield. If you have a pala healer in your group, always consult lay-on-hands with him. Hand of Freedom when you are affected by the slow. When your bubble is ready (don't use clemency), use Speed of Light & Bubble (you can macro them into one spell) to soak as many orbs as possible. Then use your self heals/hearthstone to recreate your shield. Time your runs just after the puddle phase, you need to get a new shield before the next puddle phase. You can also soak during the explosion because your shield will make you immune from its damage. In the 2nd phase, you can use hand of sacrifice on one of the tanks (remember to take the glyph). You can also use a combination of divine protection and devotion aura to soak orbs during this phase (making it 60% magical damage reduction). Hand of freedom when you have the debuff on you. Talents for AOE damage - Light's Hammer, divine purpose. My recommended glyphs are Inquisition, mass exorcism and glyph of divine storm. 4pc set bonus is very helpful here. Note that some of the NPCs can be stunned and lots of spells can be interrupted. When killing pandas, consider using Hand of Freedom on people who got into the Path of Blossoms (Windwalker panda) or got Keg Toss (Brewmaster) and don't forget Divine Protection for Brewmaster (the fire breath can hit really hard). Speed of Light a must here. Glyph of Hand of Sacrifice and Clemency. As a melee, you are not very useful during the fixation phase. If you see a player without good speed buffs targeted , try to be around 50-60 yards away from Thok, without going over to avoid the player being fixated a second time in a row. During progression on normal, you will probably 2-heal this encounter, two healers will struggle to dispel all people, especially when one healer is fixated or a person with debuff (Corrosive Blood) is fixated and they are moving fast from dispel range while healers have dispel on cooldown. As a paladin, keep your hand of sacrifice on ready for such situations and dispel people when needed. You are also crucial to make the first phases longer. Communicate with your healers. Your hand of protection will enable your druid to cast tranquility without interruption, for example. Usually you will want to put HoP on 1 healer on 4-5 stacks, then on the 2nd healer and when it ends, use devotion aura. That will enable your healers to use all their cooldowns. If you are handling the belt, it's very easy to solo it. Use Pursuit of Justice talent (enables you to move freely on the belt). Use seal of justice on the belt. It's better than seal of truth for low-health adds. If you still struggle to solo it, keep a damage cooldown for every belt (Avenging Wrath or a strength/haste potion). Use stuns for mindcontrolled players (excluding the last phase), have an interrupt on a fast key. Speed of light to move from whirling corruption fast. Use divine protection during whirling corruption. During Empowered Whirling Corruption - keep away from the raid. Use divine protection and self-heals to keep yourself alive. As a retribution paladin, you are very useful in handling adds. Use taunts and stuns to separate adds too close to each other. You can use seal of justice for the adds (you have enough time to switch seals). On a side note, if any hunter's are having trouble with getting away from Thok, they seriously need to consider re-evaluating their use of movement abilities, and should check out the hunter SoO style guide. I'm pretty sure theres a good suggestion about glyphing disengage, and going Post Haste so that they can get a nice burst of speed. Hi, I will try to keep the suggestions coming as we are progressing through HC. Regarding hunters - the problem with disengage is it requires the hunter to leap backward. I saw hunters dying when they tried to turn backwards to use it. However, the biggest problem when fighting Thok is getting two fixations in a row. Melee, including paladins, can make sure this doesn't happen by going to the other side of the room (Thok always targets the one that is furthest from him). Those hunters need to be taught jumpshooting, where the jump turn and use their offensive ( or in this case disengage) so that their speed is the same, while being able to use anything they want. But more on track: tip added! it's the furthest target withing 60 yards. the person Thok is chasing should be as close to Thok as they comfortably get, while everyone else remains close enough to the healers that they can get mass dispelled. OT: And yes as fouton pointed out, to be frank any heroic raiding hunter should have no difficulty maintaining any distance from thok. To add on, DP should be used for Immerseus, Galakras, and Spoils, while SW should be used for every other fight no question. Galakras - Enough adds to make it an excellent talent choice. Spoils - Enough adds to again, make it an excellent talent choice. Another thing, if you can manage, use Fusion-Fire Core along with Thok's Tail Tip for spoils and galakras, tested, it's proven to provide excellent dps. Added! I also put a few titles on Astherion's sections to help people find the specific tip they look for outside of the heroic information. Just a question - have you ever tried to use HA for Galakras? I was thinking about using DP there but we don't have big problems with aoe on the adds. The most heavy phase for us is the actual boss phase so I was worrying about losing single-target dps there by using DP. HA could be a balance between aoe and single-target because it still enables a nice burst. It would be a nice choice, especially with the trinket changes, but I like using DP because it reliably balances with doing Towers, as well as sitting on the ground, not saying HA is a terrible choice, I just personally wouldn't go for it. I haven't used DP since cata (when it was not really a choice). Thanks for the tip. It actually makes great difference. The more haste, the most interesting the choice is. Tested yesterday on Galakras and it was pretty nice. Notice- This advice is based only on 25m raiding, I cannot attest to how this will work in 10m. I will edit in my gemming/reforging per fight after I get through the rest of the bosses we have on farm. Tier 4: Unbreakable Spirit (allows you to dprot while padding adds in main phase, this is 40% less damage taken will you are walking through bad to scumbag adds), will be back up for explosion every time as well. 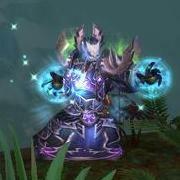 Tier 5: Depending on several factors in your own raid Divine Purpose or Sanct Wrath are viable, if you have a cleave heavy comp of scumbaggers (locks, ele shaman ect) than you will likely not get many GCDs into the adds during the bosses up phase so that makes DPurpose less valuable. IF you are in a raid with fewer cleave DPS than def go with Dpurpose because you will likely have a few procs in the time it takes to kill them. Another thing to take into consideration would be the speed that your raid pushes the boss into down phase. If your raid burns the hell out of the boss it is likely that the longer duration of wings will be wasted on at least one of the transitions. Study a stream from a prior kill or check logs to see what is best for your situation. Tier6: I continue to use ES as of now for a few reasons. 1st of all, I am an officer in my guild and consistently forget to swap back from Lights Hammer when we get to Protectors because I am dealing with loot, swaps and random raider QQ/LULZ. It is likely a better choice to grab LH for the adds IF your tank grabs them and holds them on a given spot. If not just save yourself the headache and go with ES so you aren't that guy who is talented wrong on protectors. Tier 1: Long arm is the choice for me here, with as many target swaps that are required it makes it easy to get around the relatively small room quickly. Tier 3: Selfless Healer for helping those people who like to stand in corrupted brew. Tier 4: Unbreakable Spirit is my choice here also, allows me to keep a very high uptime of Dprot for the consistent raidwide aoe that happens plus it mitigates the damage if you happen to strafe across a pool of poison. Tier 5: Sanctified Wrath, I chose this because we do not stack the bosses up for most of the fight and it helps burn the He add down faster. If your raid stacks the bosses for the majority of the fight (which is pretty common now at this point in the tier) go ahead and spin to win with Dpurpose. Tier 6: The rule of thumb on LH is simple, if the hammer can fully channel with two targets in range in is a dps gain over ES. Once again in my situation this does not happen very much. If we switch strats I will likely swap since LH also provides a nice little heal in melee range as well. Main advice: Get the hell out of corrupted brew, it hurts and taxes the healers. Make sure you are interrupting Gloom, if you don't your bros will die. Burn down He add fast but do it on top of Sun (we have our hunters handle the passing of the debuff and we ask them to stack on top of Sun) so we can cleave off of the add. Reckoning is off the GCD so toss out some taunts on the adds during Sun phase into the middle bubble and more spin to win. Offer to Devo for the raidwide AOE as often as it is off CD. Glyphs: Exo, Glyph of Inquisition and Double Jeopardy. I use Double jeopardy in lieu of Glyph of TV for the following reasons. 1. I have almost BiS HWF gear and my health pool is high enough to deal with the raidwide damage that is going out. 2. I am spec'd into Unbreakable Spirit so I have a very high uptime on Dprot that keeps me from taking high amounts of damage. Also I make killing adds a priority and typically cleave them down with DS (thus TV glyph uptime isn't even close to 100%) so that makes the TV glyph less valuable. If this fight is not on farm for you or if you have issues with survivability just keep Glyph of TV. Tier 1. Long Arm all day. Much target switching in a small room= ideal Long arm talent choice. Tier 3. Big fan of selfless healer in general. Heals can crit, SS is also viable but costs GCDs to keep up. Tier 4. Unbreakable. DProt is off the GCD and that 40% magical damage reduction is awesome here. Tier 5. Some opt for Dpurpose here due to the add cleave that can sometimes happen, I for one stick with Sanctified Wrath here. Main reason being that the adds get demolished very quickly in our raid since we have been requiring hard switches to them from everyone but the fire mages since the first week of heroic progression. If your raid is slow to kill them or if your raid leader is constantly yelling about having to many adds up, Dpurpose is likely a higher DPS talent choice for you. Tier 6. ES all the way here, LH is pointless even if the adds are slow to die there is no way they are living for the full 14 second duration. Tips: Depending on where you are in the DPS order for getting purified will determine your primary target. If you are getting purified early on focus on killing the corrupted fragments until you get purified, once purified focus more on damage to the boss and switch when you see a random fragment outside of the raid group that is not getting attention. Remember if you are not purified you are dealing minimal dps to the boss but full damage to the adds. have Devo ready if an orb is staying up to long, Dprot often to help healers/if you are running in front of a group of the fragments as they cast at the boss and if the cast hits you it can hurt pretty bad if not mitigated. You can also interrupt the cast since its off the GCD and not a DPS loss. If a big add spawns next to you, do not engage it until the tank has it, even in my gear it hits like a truck and can almost kill me. More to come tomorrow, I am tired. Feel free to ask me any direct questions in game or in my intro thread in the paladin forum. My battletag is simplyamazin#1432. Tier 3. Big fan of selfless healer in general. I don't think there is a fight when selfless healer is not the best option. ^ This. Selfless Healer is the best ret talent for that tier, as it allows for a free, hard-hitting heal, that doesn't have a cast time and can be used on anyone, vs - a HP waster, and a weak absorb shield.